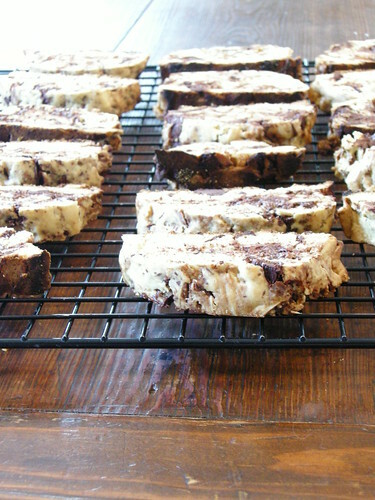 I can honestly say that biscotti is one of my favorite treats in the whole world. My mom used to buy La Tempesta's Tradizional Ciocolotti flavor, a dense almond flavored cookie studded with almond and dipped in a rich dark chocolate coat. 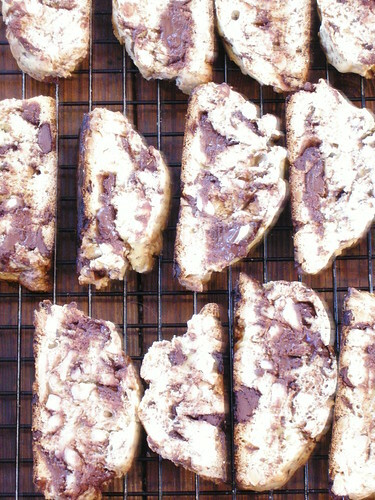 Sadly, I can no longer find these cookies, and I have been on the hunt for a similar biscotti ever since. 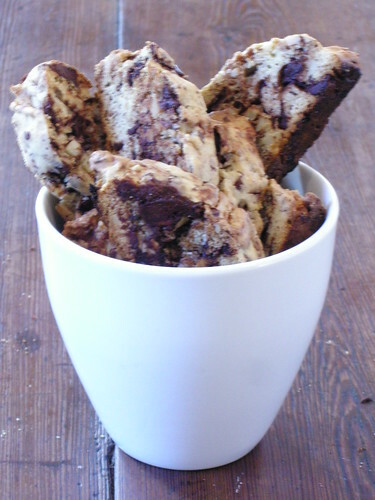 I find most biscotti to be to crumbly and soft. I like my biscotti very hard. I am going to be absent for a concert that my english class is hosting, so I thought that I would bake something to take my place. It had to be transportable, hold up well to a few days of storage, and be irresistible. My mind immediately jumped to biscotti. This biscotti, although not coated in chocolate and with a slightly subtler almond flavor, may just be my new favorite. If you have the chance, I definitely recommend baking these little wonders! After twenty painful minutes of waiting for the biscotti to finish, I yanked them out of the oven and transferred them onto a wire rack to cool as fast as my hands would move. I let most of them cool to room temperature, but one or two may not have made it into the picture! These cookies are the perfect texture and would be wonderful served with coffee, ice cream, or even on their own because honestly, what does not pair well with almond chocolate biscotti? Preheat oven to 350. Line a baking sheet with parchment paper. Using an electric mixer fitted with a whisk attachment, whip eggs, sugar, and vanilla until mixture thickens and holds its shape. Whisk together flour and baking powder and mix into egg mixture. Stir in nuts and chocolate. Form dough into two logs on prepared baking sheet, about 3 inches wide and almost as long as the baking sheet. Bake for 25 minutes. Remove from oven and turn down oven to 300. Let logs cool for a few minutes, then remove logs from pan and slice diagonally into 1/2-inch thick slices. Place sliced cookies flat on two baking sheets and bake for an additional 20 minutes. These look so delicious! My mouth is watering as I type this comment!